According to Bob Condotta of the Seattle Times, Seattle Seahawks tight end Nick Vannett is expected to play a bigger role in his second year, and could potentially push Luke Willson for the team’s No. 2 TE role. 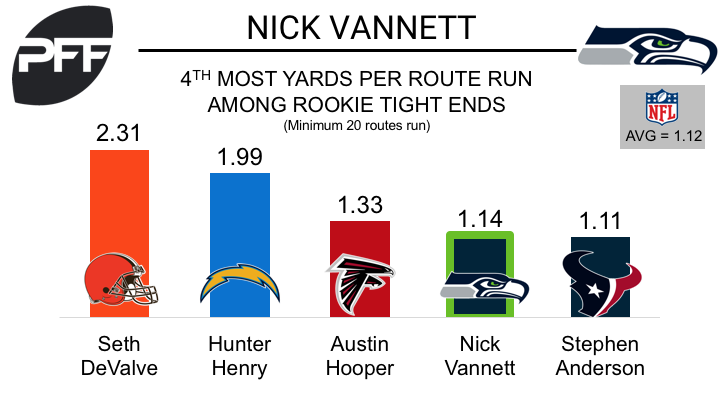 In his rookie year, Vannett played 57 snaps for the Seahawks, and saw just four targets for 32 yards. He performed well in limited pass protection, and didn’t allow a single pressure on 11 pass blocking snaps. His overall grade of 54.4 beat out Willson’s grade of 53.3 for the 2016 season. He averaged 1.14 yards per route run, which bettered Willson’s average of 0.92 and the NFL average of 1.12. He also finished the 2016 season with the fourth-most yards per route run among rookie tight ends.